Steam recently adopted a few changes, such as new chat and friends list features that brought it closer into the realm of Discord in terms of social capabilities. 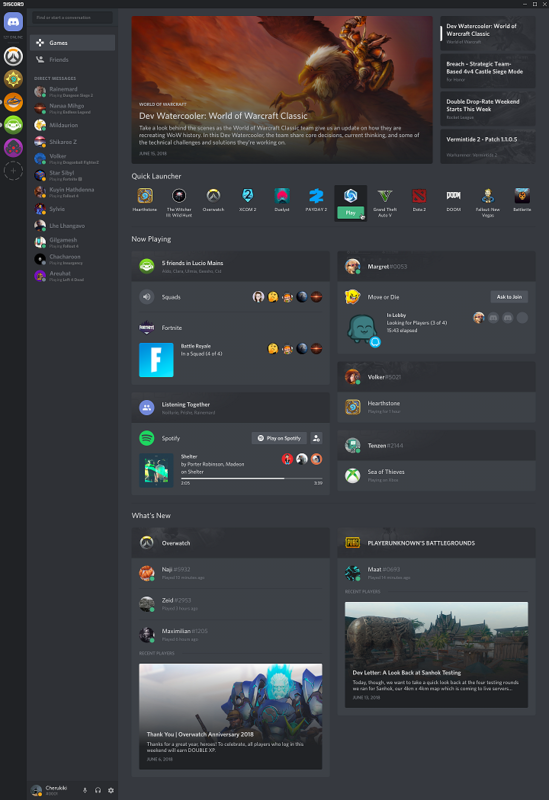 Just about a week later, it looks like Discord has launched similar changes that make it appear more like Steam. Who's trying to emulate who here? The changes are live now, introducing news feeds, friend activity, and the ability to launch games straight from the app. Discord automatically pulls information from Steam, if you have it running, about what games your friends are playing, but it'll also let you just jump into each title directly from within the program now. At a glance, when looking at the screengrab from Discord, you can see news items at the top, Now Playing, Listening Together, and a Quick Launcher bar featured in the new interface. It's quite aesthetically pleasing, even if it does bear a strong resemblance to Steam. It's interesting that both services are moving to become more like the other as the days wear on, but anything that makes things easier for gamers and consumers is obviously a boon for both parties. For the moment, it looks like you have several options now when it comes to being social while playing your favorite games. It'll be interesting to see what further changes come to both Steam and Discord with these alterations in mind. Will they end up joining forces one day? Probably not, but they're pretty close now as is.